Young boys suffering from Hansen’s Disease at the Kalawao settlement in what is now Kalaupapa National Historical Park. What would it be like to be forcefully removed from everything you knew, including your home and your family, and then exiled to spend the rest of your life in an isolated settlement, separated from the outside world? Approximately 8,000 individuals had this experience, when, having contracted Hansen’s Disease (leprosy), they were forced to the Kalaupapa Peninsula on the Island of Moloka`i. Farmers, clergy, Hawaiian royal family members, men, women, the old and the young, no matter what their ethnicity, they lived and often died far from all that they had known because they were “lepers”. Begun in 1866, the colony on the Kalaupapa Peninsula was where Hansen’s Disease patients were sent in order to limit the spread of the disease. Although the Kingdom of Hawai`i did more to care for Hansen’s Disease patients then all other governments up to that time, the terrible conditions of the settlement have become legendary. 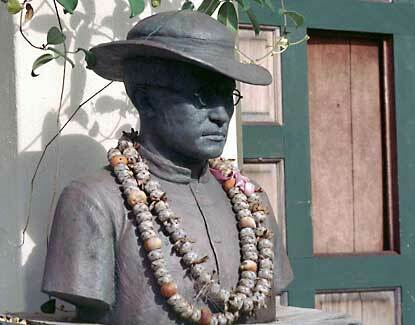 Statue of Saint Damien, who spent his life to help the people of the Kalaupapa Settlement. The State of Hawaii did not remove confinement laws until 1969. Now, only a handful of patients choose to remain on the Peninsula. In 1980, Kalaupapa National Historical Park was established to preserve the legacy of the patients’ lives and to tell the stories of those that gave up their lives to help them, including Saint Damien.